Tater tots. Classic cafeteria lunch food right? The reality is, they really are not very different from french fries. Potatoes, fried in oil. But kids love them! 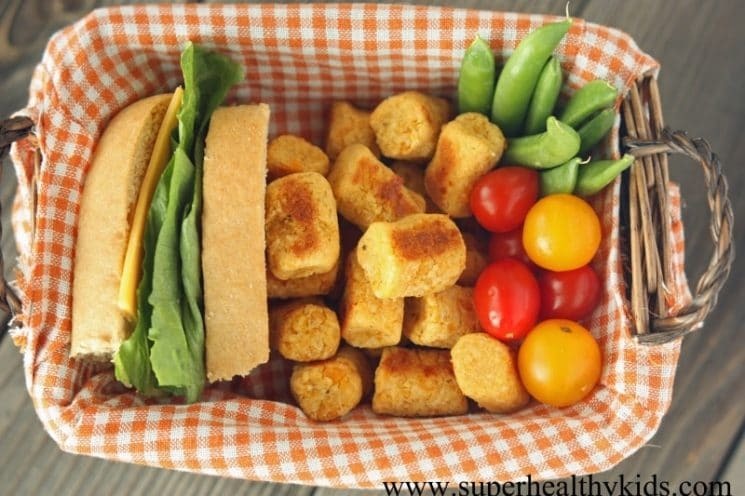 Our version is made from garbanzo beans which are high in fiber, protein, and B vitamins. We bake them instead of fry and they still turn out crispy, but are healthy and delicious. 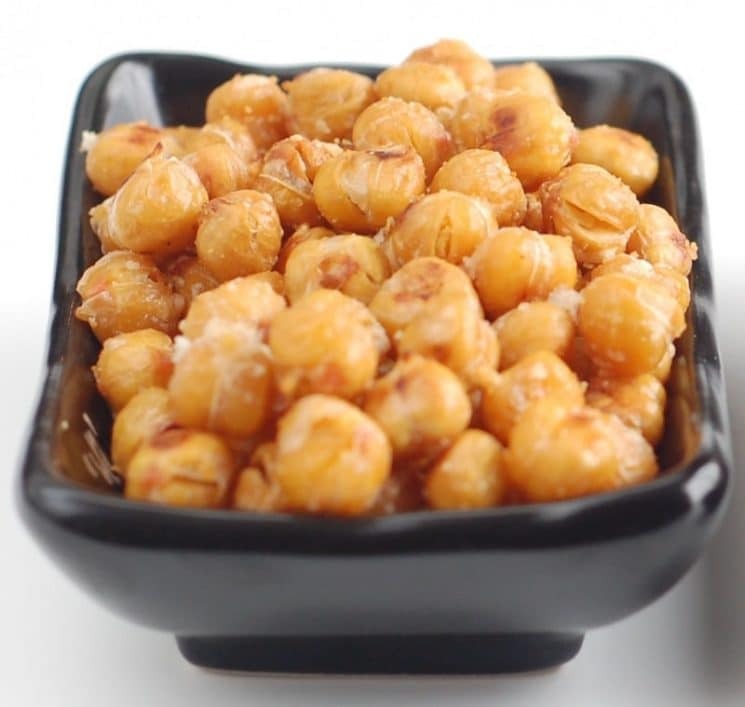 Garbanzo beans (aka chickpeas) are so versatile, and really make great kid food. They are super nutrient dense, which we love because sometimes kids don’t eat a lot at a time. If you can pack in the nutrients in a smaller amount of food, then you definitely don’t stress as much about how much your child is eating. These tots are a great way to do this. They literally have at least double the nutrition that a regular tater tot would have. This is how they stack up against potatoes. 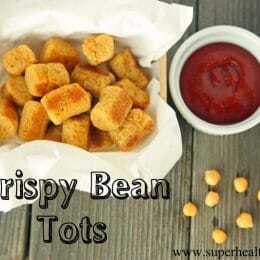 This Crispy Bean Tots Recipe is super easy to make. Combine your ingredients in food processor until relatively smooth. Then form the dough into a long roll. 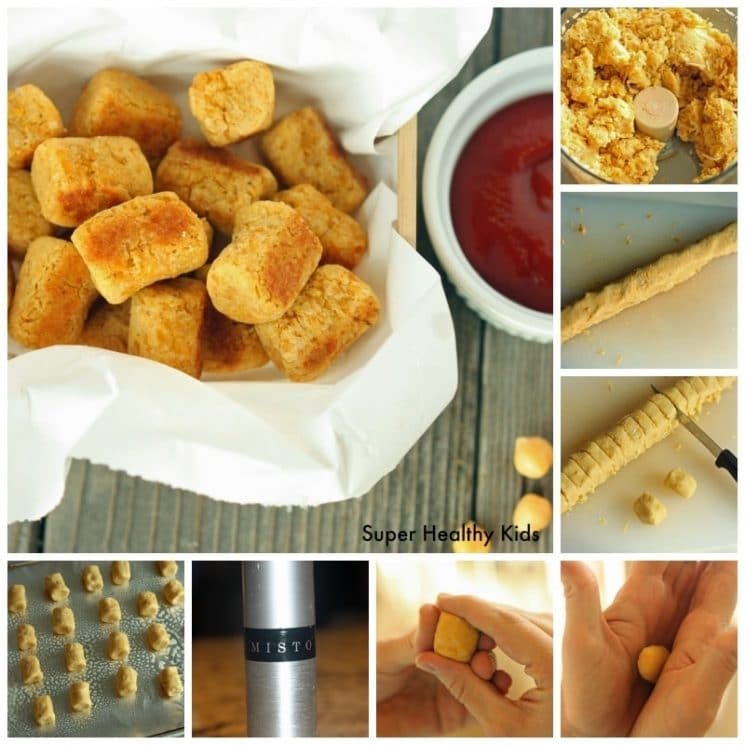 Slice it up into small pieces and shape into tots by rolling them between your hands, and then flattening the ends. Spray generously with oil. I LOVE my Misto oil sprayer. You can fill it with any kind of oil you want, and then use it as a spray! Genius. Bake and then serve warm! My kids like to dip in ketchup (every kid loves ketchup right?) We like the Trader Joe’s brand. 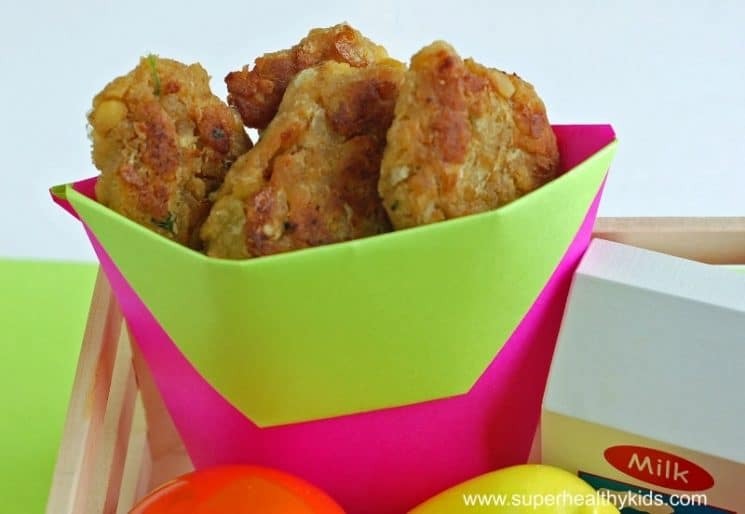 Serve these with a sandwich and some veggies as a yummy lunch, or a fun after school snack! Drain and rinse beans. In food processor, combine all ingredients. pulse until smooth. Remove from food processor, and form into a roll. Slice into small pieces. Form tots by rolling into between your hands, and then flattening the top and bottom. Spray the tops with cooking spray or a little bit of oil. Bake tots for 10 minutes on one side. 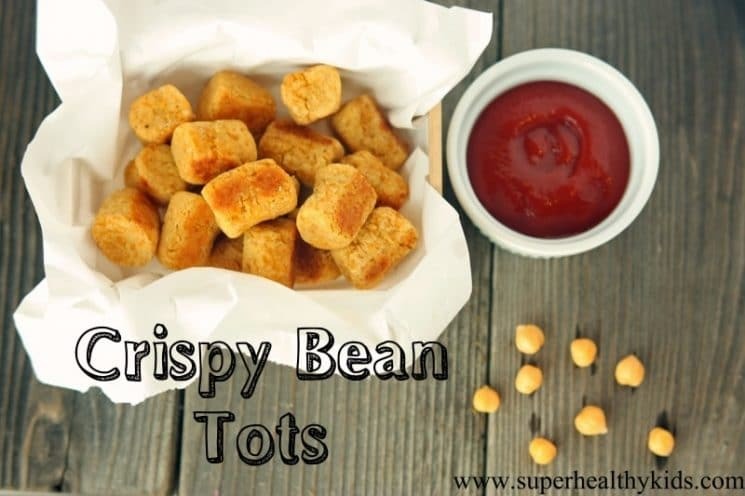 Turn the tots over and bake for an additional 5 minutes, until they are golden and crispy. We are dairy free, do you think it would work without cheese? If I made a bunch, would they freeze in a bag and reheat in the toaster? Yes. They freeze nicely, and then you can just reheat in the oven or a toaster oven works great also. I would never have thought of using chickpeas like this! I’m a huge HUGE potato fan – but the carb load doesn’t do nice things for my blood sugar. What a cool alternative to try! Looks yummy!!!! What’s Panko bread crumbs? Any substitute for that ?? Thx.. I bet if you use Daiya “cheese” it would work for a dairy free option. My question is what can I use instead of Panko, because I need a gluten free option. 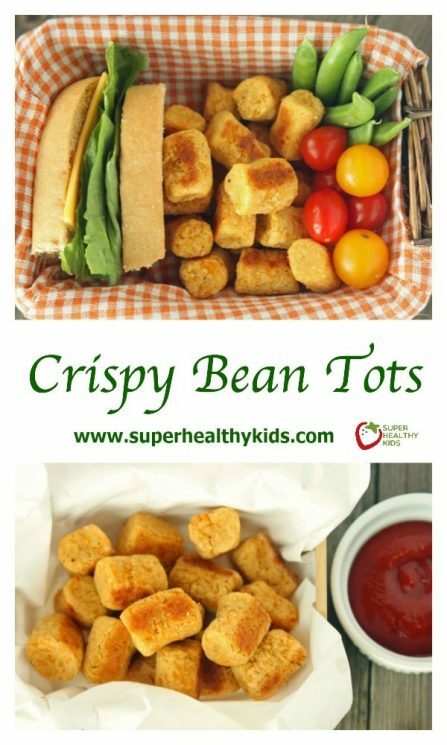 My daughter has a severe peanut allergy and cannot tolerate garbanzo beans as it is a cousin to the peanut – will any white bean stand up in this recipe? Would you cook them before freezing or just freeze once shaped and cook as needed? Panko is a Japanese-style breadcrumb. Panko is coarsely ground into airy, large flakes that give foods a light, crunchy coating. The flakes tend to stay crispier longer than standard breadcrumbs. You can try regular breadcrumbs. You could try processing gluten free bread in a food processor and toast it until it is nice and crispy. Yes, I’m sure any white bean would be delicious. I would freeze them after they are baked, and then reheat them. Excellent blog! Do you have any tips for aspiring writers? I’m planning to start my own site soon but I’m a little lost on everything. Would you recommend starting with a free platform like WordPress or go for a paid option? There are so many choices out there that I’m completely overwhelmed .. Any tips? Thank you! We are egg free also. Do you think we could substitute a little chia “egg” for the egg in this recipe? Or just leave it out all together and maybe use dairy free mayo or something like that? Just trying to figure out what would help to make it bind besides eggs. We made these super easy took me about 15 minutes start to the oven and I LOVED them (also tested by babysitter and another friend who both couldn’t stop eating them). Was like an oven baked hummus fry. The kids have never had these before and weren’t all about trying them but did take a bite. These you feel good eating!! Will definitely make them again. Yes I definitely think you could use dairy free mayo, or chia ‘egg’, or even flax ‘egg’. It really is a small amount of binder, and so won’t change the recipe very much. What a great way to describe them! I thought these came out great! I accidently added one can of beans without draining them. Now the mixture is super wet. I already added all the ingredients, including the crumbs. Just made these with beans and had the seame problem, very sticky. I out olive oil on my hands to help form little balls of these and baked for the time stated. They are soft, so how can I be sure the egg is fully coked? Processing gluten fee bread, toasting and processor ..works great in our program. we do it all the time. Hello, i read your blog from time to time and i own a similar one and i was just wondering if you get a lot of spam remarks? If so how do you reduce it, any plugin or anything you can advise? I get so much lately it’s driving me insane so any assistance is very much appreciated. You can always try adding more bread crumbs to make it less sticky. Good luck! Beth – you are completely right! I had calculated for a larger portion than 1/2 cup. The table is updated and correct 🙂 Thanks for catching it! Is it necessary to use the canned peas. Can I use the freshly boiled? What size cans for the beans? Wow Natalie!! This snack is GREAT!! I just made them and they turned out amazing!! I can’t promise I’ll save some for my kids, since I already ate half the bunch 😉 For sure will make this again, fun to make, quick and easy!! Could you, please, indicate how much of the beans are in each can that you are using? I use a 15.5 ounce can – there is about 2 cups of beans in each cup. Can I use lima beans instead? They would not turn out the same. We recommend only using chickpeas for this recipe. I tried making this with some substitutions since I’m vegan, but it turned out super sticky like a dip and didn’t cook all they way through due to that :/ I used a flax egg instead of an egg, and a little vegan havarti cheese (not 1/2 cuz bc I didn’t want that much). I thought using pieces of bread instead of breadcrumbs would work but it didn’t help make it less sticky even though I added 4 pieces of bread. I ended up having to stir in a ton of garbanzo bean flour which helped a little but over all I had to just plop some balls into a cookie sheet and hoped for the best. I should have put oil down before hand as it stuck and even though I looked them for 13 minutes on the first side it wasn’t all the way cooked through. They still turned out yummy but next time I’d probably use 1/4 cup applesauce instead of the flax egg and more bread crumbs. Is the recipe supposed to say 2 *cups* of chickpeas? Or two cans? Just wanted to be sure since it says “2 can” and then later specifies (again?) that you use canned. Thanks! I just made these with one can of mixed beans and one can of chick peas. I also added a whole shredded carrot. They were delightful! How many servings does this make based on the nutritional info? Hey Natalie! My recipe turned out too sticky and moist, what could I have done differently? Made these little nuggets and was so excited that they turned out so well and tasted even better. My kids were a little hesitant at first to try them, but then nibbled them up. They kind of remind me of little baked tofu bites but with a better consistency or little biscuit bites. 🙂 I didn’t dip mine, instead I put a tiny pat of butter on each one. I made the dough ahead of time and formed it into logs. I put it in my fridge for about two hours, and they were really easy to cut into pieces. Next time, I may increase the amount of cheese or try flavored bread crumbs.